Tomahawk steak is a cut with serious street credibility. 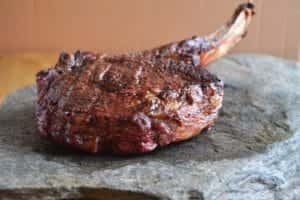 Tomahawk is a ribeye steak with bone like an axe handle. My cut was 2,6lb (1,2kg) and 1 1/2 inches (4cm) thick. Even when the bone takes decent share of the weight, there is plenty for three people as was my plan. Given the size, this steak should not be cooked on direct heat only. 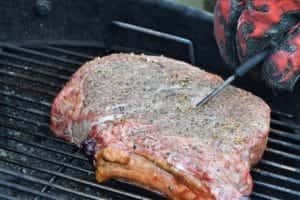 Go reverse sear and get nice medium rare result with grilled finish. 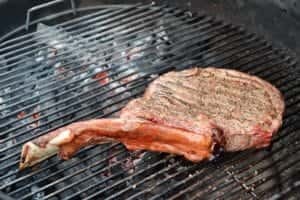 Before rushing to your grill, take your Tomahawk into room temperature. Taken directly from the fridge, it takes easily one hour to warm up. Now, rush to your grill. My set up was Weber Master Touch 22” and Black Ranch charcoals. 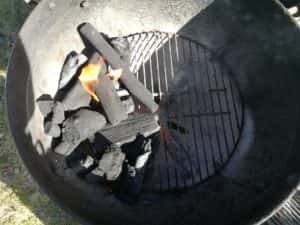 Half of the grill I loaded with charcoals while other half was left empty. I used Weber lighter cubes for the ignition just placing two cubes among charcoals. Next time I will use chimney starter as this method was quite slow to get heat up. Once the grill ambient temperature was 430°F (225°C), I placed the steak on the empty half of the grill. This is called indirect grilling method. It cooks the steak like the oven, slowly and evenly enough to be finished later on direct heat. Remember to keep your lid closed. If you are looking, you are not cooking. 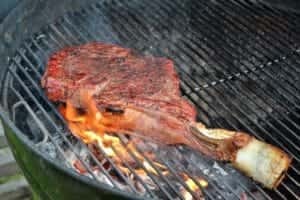 Tomahawk steak is thick, but cooks in 20-25 minutes. You absolutely need a good thermometer to follow the progress. I used my iGrill and iPad app once again. Digital age is so much fun. After 10 minutes, I flipped the steak around and continued cooking. When inner temp of the meat got to 95°F (35°C), I pulled the axe out and covered it with foil. I gave it a good 15 minutes rest before searing. 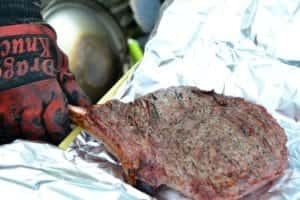 Taking the steak out early enough is important as it continues to cook in foil. While the steak was taking a nap, I took a beer for an appetizer. This is the right moment as you are not far from your dinner. 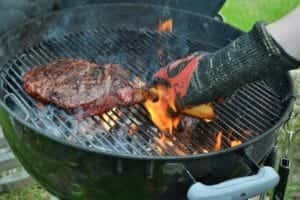 Searing is simple when using good quality charcoal. They keep temperature high enough so I just placed my Tomahawk directly on top of the heat. Dripping grease will give some flames but do not worry. They look very cool so you better get some audience for this one. On searing I flipped the steak around couple of times to get nice finish. I used my Dragon Knuckle gloves as they tolerate heat extremely well and give good protection for hands. If you don’t have them yet, get them from Amazon or just use your tongs. I was aiming at medium rare steak, so I checked the inner temperature with my Thermapen while searing. Thermapen is very good tool for this as it reads temperature very fast. Once it hit 130°F (55°C), I was done with my beer and ready for the dinner. Oh yes, I almost forgot the side dish.